Hospital Medicine Fellowship at Regions hospital. He is an experienced results-driven provider with frontline and administrative experience in the areas of Hospital Medicine and Surgery. Furthermore, he has extensive preparation as a critical care/emergency/transport (fixed, rotor, and ground) nurse that supports his ability as a nurse practitioner. He has over 20 years of experience in healthcare having started at the bottom and worked his way up. There is not much he hasn’t done. 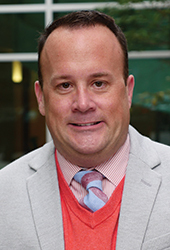 He completed his advanced practice education at Loyola University Chicago, one of the earliest Emergency Nurse Practitioner programs in the country. He is currently completing his Ed.D in Organizational Leadership with an emphasis in Conflict Resolution, Mediation, and Ethics at Abilene Christian University. His areas of research include advanced practice education (including new and novel care delivery systems), healthcare communication, and conflict resolution/mediation at the end-of-life care.